Religious life is not a career or a social movement. It is a divine romance. Our spouse is Christ Jesus, our children are the souls for whom we pray and offer our lives. And for those called to this holy vocation, every day is an opportunity to love more deeply by conforming ourselves to our Bridegroom and be swept off our feet by Him. After all, we not only wed “Mr. Right” – He’s “Mr. Perfect”! 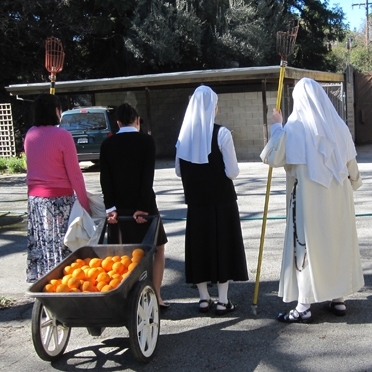 So, how does religious life compare with dating and marriage? Well, in both vocations, one is first growing in their spiritual life. Then, you put yourself out there to meet someone (a community), get to know them (we’re just friends: inquirer/candidate with a religious community), mutually decide to start dating (perhaps you’re “the one”: aspirancy), commit to date each other exclusively (I really think you are “the one”: postulancy), enter into an engagement to marry (novitiate), profess marriage vows (simple vows), and finally seal the marriage vows with consummation (solemn vows). Perhaps you see an announcement in your parish bulletin, or a website/blog, or hear about a “Come-and-See” opportunity. Regardless, just as you don’t find a spouse by sitting at home, you can’t discern religious life properly without meeting some communities. So you get out there and begin meeting communities and getting to know them, their life, and what they are about. After a time of correspondence and a few visits with a community, you decide, “Perhaps there’s something serious here.” And, if the community agrees, you have a time of aspirancy. Aspirancy is a bit like steady dating (or courting, if you prefer). The community permits the young woman to come inside the cloister for a time of deeper discernment. In our community, the time given for aspirancy is one month. During that time, the aspirant joins the novitiate community and enters the daily rhythms of religious life: prayer, liturgy, work, recreation, meals, silence and laughter. Then, the young woman returns home to consider and pray about all she’s experienced (while the community does the same as well). 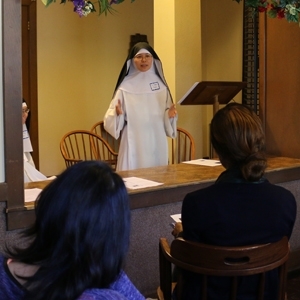 If the young woman and the community mutually agree “I really think you are ‘the one’”, the young woman can take the next steps to apply to enter as a postulant. Just as in dating/courting, you reach a point of committing to be in an exclusive relationship with another person prior to making a formal commitment to that person, so too in religious life. The time of postulancy is a time of committed discernment. A young woman has given up most of her possessions, her car, her apartment, and her job, because she has been led by God to believe this really could be the place He has called her. But she has not yet made a formal commitment, nor has she even committed to enter into that commitment. It is a time of learning more about what that commitment will entail, with the joys and crosses of religious life and observance of the Rule. Postulancy in our community lasts six to twelve months. The day has come – the postulant is clothed in the Dominican habit, donned with the white novice veil, and given her new name. It is at this moment that she is made a novice and is now truly a child of the Dominican Order. Her engagement to Christ Jesus is announced and she applies herself even more diligently to her prayer life, observance of the Rule and Constitutions of the Order, and conforming herself to her Beloved. To allow her enough time to lay this foundation which needs to be strong enough to support the rest of her religious life, the Church mandates the novitiate must last at least one year before a novice may profess vows. Our community has a two-year novitiate period. Oh the joys of a wedding day! The white veil of the novice is to be exchanged for the black of a professed nun! Her habit scapular is blessed and it is this day that will be counted for all future anniversaries, for it is this day that the young woman publically professes her commitment to Christ and his Church in the Order for the first time. Simple vows are professed for a period of three years. At the end of the third year, our community requires two renewals of one year each; as a result, a nun is under simple vows for a total of five years. Just as a marriage must be consummated to be made binding until death (assuming it is valid in all other respects), it is the profession of solemn vows which consummates the bond between a bride of Christ and her Beloved. For it is at solemn vows that the bride of Christ professes her vows “until death”. A simple gold band is slipped on her finger and as her veil is blessed, she is reminded that she is forever a “house of prayer.” But the story does not end there with a “happily ever after.” Just as after the wedding, there comes children and sickness, heartaches and beautiful joys, tragedy and celebration, in a religious vocation, after vows the best (and hardest and most painful and most beautiful) is yet to come.